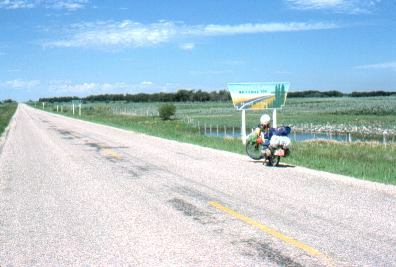 The Saskatchewan border, on June 14. In the very far distance is Moose "Mountain". Yes, here in the prairies this is called a mountain! I took a side trip up this road to see what the view would be like from the top. Because the overall country is so flat, you can see a very long way from the top of even such a low "mountain". 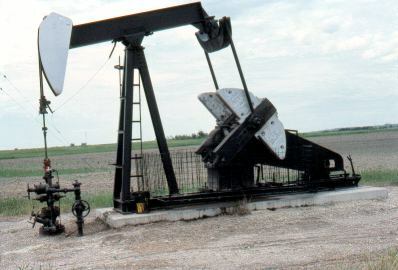 Oil wells are a common sight in the western prairies. 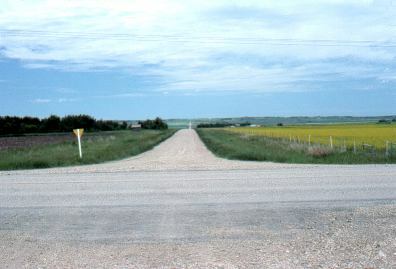 Regina can be seen here in the far distance, 18 miles away. 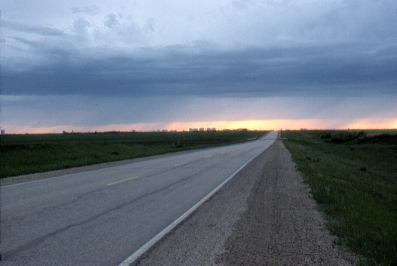 Some thundershowers can be seen in the distance. When one hit me I took refuge from the rain in a shed down a dirt lane. I didn't realize that the dirt on the lane was actually clay. When the rain passed I tried to ride the bike back to the highway. The sticky clay quickly filled the small space between the tires and fenders of the moped, jamming the wheels. I had to drag the moped to the highway and poke the muck out with a stick. 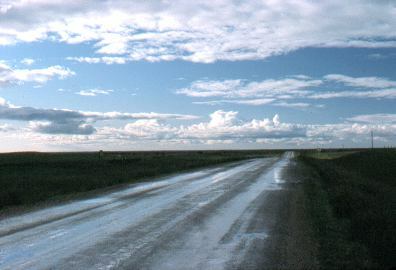 Past Regina, the big open prairie sky, after some more rain. I didn't hide in any more sheds down dirt lanes, though! On the trip I camped just about anywhere that I could be out of sight of the road. Here, along a little-used railway. 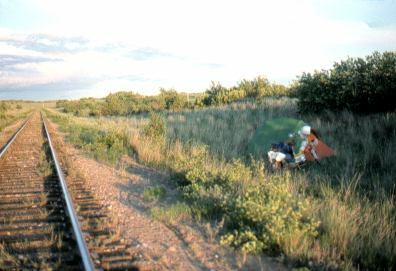 Camping beside a railroad is ok, so long as a train doesn't come along at night. 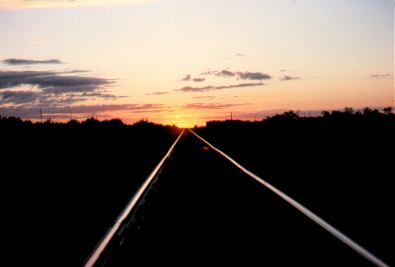 One time when I camped in such a place, a train did come along. I remember that I awoke with a start, frantically feeling the ground through the tent floor to make sure I wasn't camped right between the rails! Once I woke up a bit more I knew I was ok, of course. Beautiful prairie sunset right by my self-made campsite.